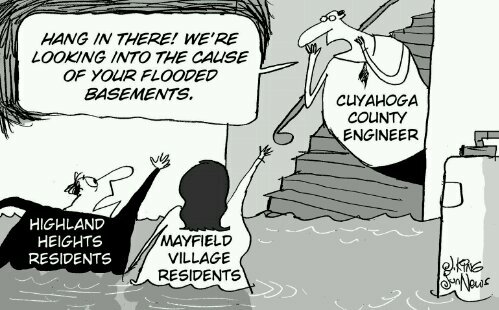 With record levels of rain in Cleveland this year, many Northeastern Ohio homeowners have suffered from flooded basements. Unfortunately, if the damaged carpet, soaked padding and wet drywall wasn’t removed, it’s likely the once flooded basements have turned into festering grounds for toxic mold. Moist materials are a perfect breeding ground for mold, so mold growth is likely in areas affected by water leaks and flooding. Any flooded area that was not completely dried within 24 hours is likely to have mold growth. surfaces such as drywall, paper, and carpet padding, so these materials should have been removed and discarded. Exposure to mold can cause respiratory problems, nasal and sinus congestion, watery eyes, sore throat, coughing and skin irritations, and may trigger asthma attacks. If you want a mold inspection, or you have mold that needs to be professionally removed, call Dutch’s mold inspections.